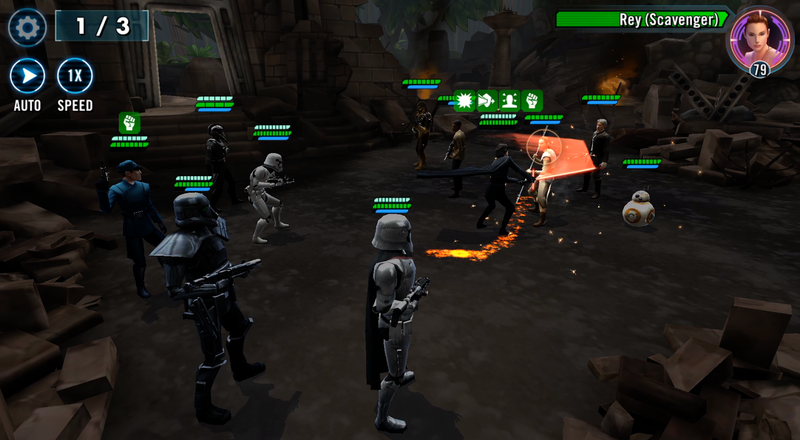 Playing Star Wars: Galaxy of Heroes on PC is made simple using MEmu Player Android Emulator. Star Wars: Galaxy of Heroes is a turn-based game; meaning your team will have a chance to attack enemies, thereafter they will return in their attacks until the battle is won. It features characters from several Star Wars universes including; Star Wars™: The Force Awakens, Rogue One™: A Star Wars™ Story and Star Wars™: The Last Jedi™. Therefore, you can build the ultimate team from either the light or dark side. Progress through rounds of battles, conquer giant bosses, train and level up your characters and become master of the galaxy! With MEmu Player you can marvel at the iconic Star Wars locations on the larger screen of your laptop or computer. Additionally, you can set keyboard shortcuts for attack button using the “keymapping” features! I recommend playing Play Star Wars: Galaxy of Heroes on PC using MEmu Player. If you haven’t downloaded already, please install it here. Once installed you will see it on your home screen list of apps. Simply open it and the first launch will begin to download game resources. Once complete you will able to play Play Star Wars: Galaxy of Heroes on your computer! Collect Heroes From All Universes. There are over 120 characters from various Star Wars eras including; Grandmaster Yoda, Commander Luke, R2-D2, Darth Vader, and more! Epic locations. Journey across the various Star Wars galaxies in iconic locations as experienced in films. Create the Ultimate Team. Collect them all to create the ultimate team to fight with your favorite dark and light side heroes. Make key strategic moves and pick teammates with complementary abilities to go to war with unbeatable squads! Play Against Other Players. In Star Wars: Galaxy of Heroes on PC you can fight other players in Squad Cantina Battles, PvP Squad Arena, and Squad Tournaments. Assemble a Fleet of Iconic Ships. You are not limited to just turn-based ground bouts. Take to outer space and dogfight while collecting iconic starships. Fleets, too, can be upgraded and have a crew along with special powers. Battle Epic Bosses. The epitome of challenges lead to the recreation of epic boss fights. Conquer notorious baddies such as Rancor and AAT Tank. Fight in Guilds. Collaborate with your Guild in Territory Battles where members unleash their entire arsenal of characters and ships against a progressively evolving battlefield. In Star Wars: Galaxy of Heroes you must constantly collect and build your heroes. You unlock more characters by fighting battles. Alternatively, you can find packs and shipments or purchase them with Shards. Taking part in battles and events helps to train your characters. Additionally, equip them with gear sets to increase their gear level and unlock new abilities. You should complete daily activities for rewards, continually increase your player level and join guilds to earn points that can be used to buy packs. For more in-depth guides please visit EA’s helpful tutorials.